Craftin' Caro: More from my Team Gathering! More from my Team Gathering! Several of my "Canadians, INK!" 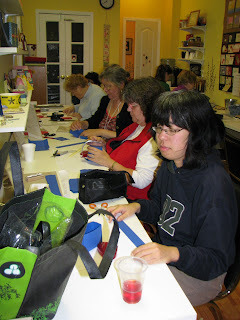 team gals came over Saturday evening for some stamping and we had such a fun time together. Christyne, Dina and Joyce all did some cool stamping demonstrations for us, everyone made 4 Holiday themed 3-day projects, I have away tons of door prizes and also had some beautiful cards dropped off! Oh, and let's not forget Janet's amazing cheese dip... deeeelish :) She was kind enough to share the recipe with us and so I've posed it on the team blog, as well as directions for all 4 projects. Christyne and I will be preparing the long-distance packages next week when she returns to the studio. All in all, I'm amazed by the talent and enthusiasm of the demonstrators on our team, and just love having a chance to get together with them. Our next gathering will be on Saturday December 12th - please RSVP a spot to come and check it out and learn more about the fun we have together. Here are some of the 12x12 craft baskets -- just some stamping, ribbon and a tag! A holiday gift-card holder... slide off the belly band and in opens up with a pouch to hold your recepient's gift card inside. A Brilliant Blue Top Note die tote, with white satin ribbon handle. The perfect size to fill with holiday candies :) Just emboss the trees & sentiment with White craft ink and Iridescent Ice embossing powder for some extra razzle dazzle.